There are many gardeners who would like to add a feature with water plants to their garden, but don't have the time or space to do so. For these folks, a water based container garden is just the ticket. Even apartment dwellers can add the soothing sound of running water to their balcony or patio. The most common container for a water garden is the half whiskey barrel. These can be actual whiskey barrels or replicas. There are liners available if you want to have the real wood barrel look. Other containers such as galvanized wash tubs and hypertufa planters can be used also. The container gardening design rule of thrill, fill and spill still applies to a certain extent. You can have a larger plant such as taro or papyrus along with a showy floating water lily. The spill effect can be obtained by adding smaller containers around the main container. Plant them with vine-like plants such as sweet potato vines, vinca or even some nasturtiums to mimic the water lilies. William Tricker Website More so than a regular container garden, the rule of "less is more" applies here. A water container garden looks best with only two or three plants instead of the usual overflowing look. Water garden containers can be stacked and, with the aid of a pump, made to flow into those below. Speaking of pumps, having a small pump to keep the water moving is important. Stagnant water will quickly become a breeding ground for mosquitoes. Placing a small pump to feed a gurgling fountain will do the trick. It also adds the soothing sound of moving water to the water feature. You may also add an aerator that puts oxygen into the water as well. 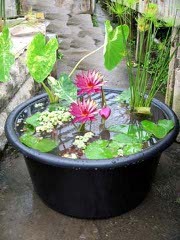 A container water garden is not unlike an aquarium, in fact adding a goldfish or two will make it more interesting. Mosquito larvae are a favorite of goldfish, and having a balanced ecosystem will make the water feature all the more pleasant and healthier. If mosquitoes become a problem there are products on the market that are organic and safe to use. These are sometimes called "dunks," probably because they look like little doughnuts that float on the water. They contain Bacillus thuringiensis or BT for short. This bacterium is ingested by the mosquito larvae and they soon die. Like other container gardens, a water container garden is only limited by the space available and your imagination.